Nora West-Allen is the fastest woman alive and in 30 years becomes the protector of Central City. And we find out that she is very much Daddy’s Little Girl. We start season 5 exactly where we left off season 4 and that is Nora crashing Cecile’s baby shower to introduce herself to her parents and the extended Flash family. Ralph is now finally catching on about the time travel adventures of the Flash and Barry is skeptical that Nora is really their daughter. Nora announces that she can’t build up speed fast enough to go back to her time. When they all go back to Star Labs, all testing and signs point to Nora being the daughter of Barry and Iris and named after Barry’s mom. Team Flash asks Wally to visit the Legends to test Nora’s blood and if anything take her on the Waverider to bring her home. Barry is then called into work as he has recently been re-instated and returns to a backlog of cases as Singh didn’t replace him. Nora soon arrives to help her dad out as it turns out she became a CSI just like her dad. 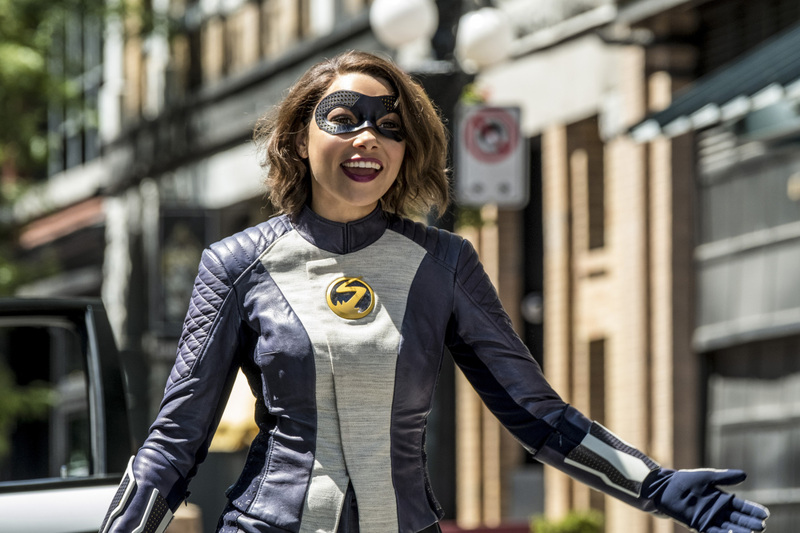 As the two bond over forensics and shared love of two scoops of cookie dough ice cream from a ice cream shop in New Hampshire, the Flash is soon called upon to catch a meta that Nora knows as Gridlock. Nora has learned a lot about Team Flash and their adventures and villains from the Flash Museum. When the Flash goes to confront Gridlock, it seems that he gets more powerful after the Flash punches him. Things get worse when Nora arrives to see her dad in action and Gridlock escapes, something that wasn’t supposed to happen. To prevent Nora from wrecking the time line any further, Iris takes her to Jitters for some coffee and some mother-daughter alone time. Iris starts to ask questions about their future and she learns that her daughter followed in Barry’s footsteps versus hers and things are definitely chilly between the two. Back at Star Labs, Team Flash figure that Nora could use the same tachyeon device that Barry used in season 2 to help increase her speed combined with Barry speed to help her get home. Nora is giddy at using the device that allowed Barry to first meet Supergirl. Just before they leave, Nora mentions that she will spend her life with her mom and then hugs Barry tight. The two enter the particle accelerator and begin to speed up, however, Wally comes back from his visit with the Legends to say they need to stop Nora and Barry. It seems that Nora has negative tachyeon in her system that has negative effects to her travelling back in time as well as the Legends trying to take her back in the Waverider. So Nora is stuck in the present. Barry believes everything is screwed up now with their adult daughter in their timeline and hoped that he would be the parent in the correct timeframe and experience all the firsts. Iris’ assures her husband that things will be all right. A light bulb moment goes off in Barry and sees Nora look longingly at a Team Flash photo. Barry asks Nora what happened to him. In the time vault, we learn that when Barry vanished in the future, he never came back hence why Nora is so clingy to Barry as she never knew her father. The first time Nora met Barry was at his wedding. Barry realizes that Nora lied about not being able to get home so she can spend time with her dad and mentions she is not as good a speedster as her dad as she can’t even phase yet. But Gridlock is still in the wind and Team Flash discover he is on a plane for some unknown reason that could do with the briefcase attached some a fellow passengers wrist. Gridlock kills the passenger and uses the surrounding kinetic energy to bring down the plane. Team Flash realize that they need to phase the plane between buildings so it can land safely into the water. But Barry has no suit but Nora offers a solution and that is a suit in a Flash ring designed not by Cisco but Ryan Choi. Cisco vibes Barry, Nora and Wally on the plane and thanks to G-force, manage to capture Gridlock. And after words of encouragement that Barry borrows from Wells, he, Wally and Nora manage to phase the plane to go through buildings and land safely in water. Back at Star Labs, Barry decides that he doesn’t want his daughter to return and Nora ends up staying in the unknown lounge area of Star Labs that Joe has been using since Day 1 to take naps. Nora can’t seem to go to bed to father-daughter take a run for some cookie dough ice cream. Elsewhere, Ralph has a theory about “many-verses” and learns that Caitlin is no longer Killer Frost. Ralph uses his detective skills to learn that Caitlin’s presumed dead father is probably not dead as the ME who signed the death certificate is a fake. And apparently, Cecile still has her mind-reading powers. In a voice-over, we hear Nora once again say her name and that she is the Fastest Woman Alive but now we learn her mission is sto her dad from disappearing. In the coda, Gridlock is being transported to prison but is stopped when a lightening shaped dagger falls from the sky. The villain, Cicada, kills the guards and sets his sights upon Gridlock to kill his kind. So it looks like Cicada is after meta humans.